There are basically two causes of Wallerian degeneration in our definition: neuronal cell death and axonal lesion. It should be noted, that our definition is wider than usual and not only includes acute axonal lesions, but neuronal and axonal lesions of any kind. Degeneration of the entire arborization of a neuron with its axon and axonal branches inevitably follows necrosis of the neuronal cell body. Examples are degenerative diseases affecting neuronal cell bodies and axons, such as Friedreich’s disease, olivopontocerebellar atrophy, and ceroid lipofus cinosis. A lesion of the axon that leads to an interruption of its continuity gives rise to degeneration of the distal part, whereas the proximal portion survives. The myelin in the distal portion undergoes dissolution as a consequence of the axonal degeneration, as the integrity of the myelin sheaths depends on continued contact with a viable axon. The changes in the distal part of the interrupted nerve are called Wallerian degeneration in a narrower sense, following Waller’s original description of the changes that he observed after cutting the glossopharyngeal and hypoglossal nerves in the frog in 1850. Any lesion of the axons that leads to an interruption and any lesion of the nerve cell bodies that leads to the cell death is followed by Wallerian degeneration. In the CNS common causes are infarction, hemorrhage, tumors, and head injury with shearing of nerve fibers. In all white matter disorders, Wallerian degeneration eventually plays a role, as myelin loss is followed by secondary axonal degeneration, which in turn is followed by Wallerian degeneration of the distal parts of the axons and their myelin sheaths. 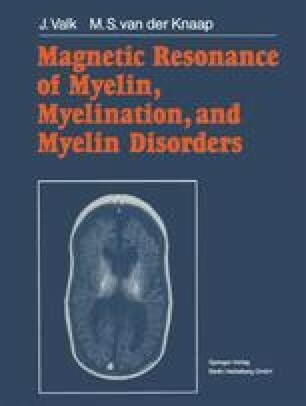 As such, Wallerian degeneration cannot be considered a disease primarily affecting myelin. Nevertheless, Wallerian degeneration with demyelination secondary to neuronal and axonal degeneration are discussed here as a component of all disorders and because their MRI appearance may be mistaken for primary white matter affections. This is especially the case when the cortex and the neuronal cell bodies are unaffected. An example is the traumatic shearing of nerve fibers, which may lead to bilateral extensive white matter degeneration whereas the cortex is remarkably normal.